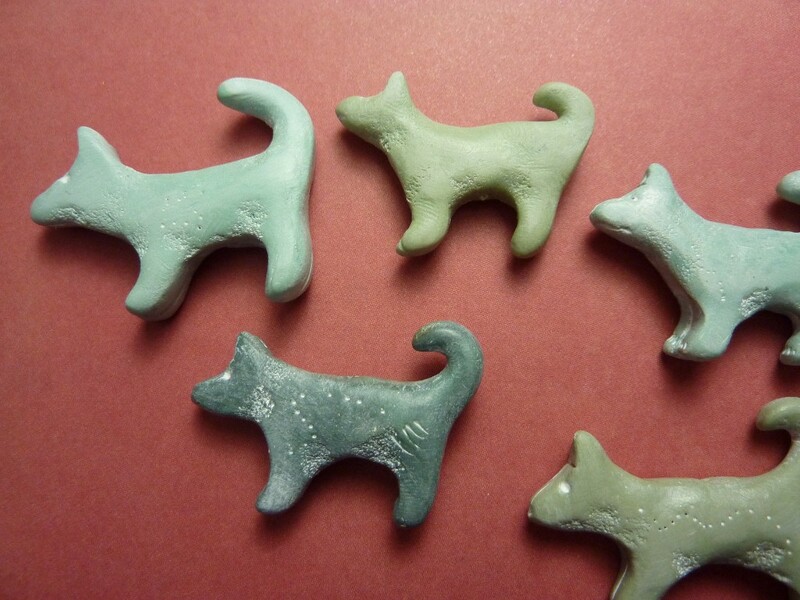 Last week I made my first little dog artifacts. 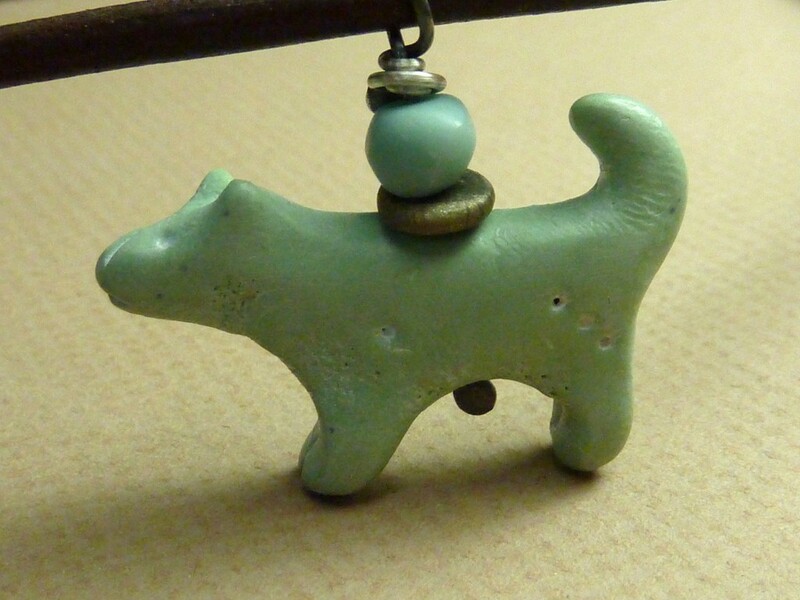 My very first little dog artifact, in faux green soapstone. Today I have pics of my very first dog pack. I love them so much already! 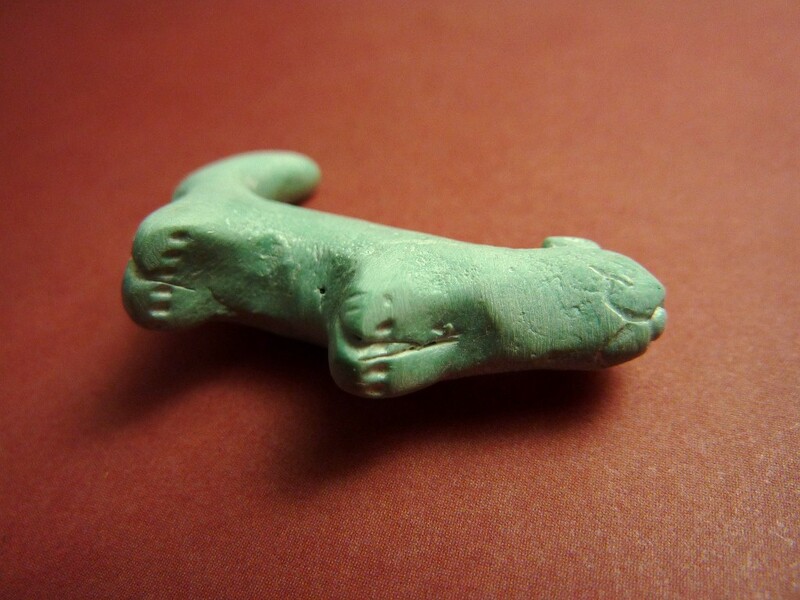 I stayed with a very ancient-looking prototype, with long snout, upright and slightly cocked ears, and a curly tail. The curling tail seems to be the discerning characteristic of a dog versus a wolf or coyote. I could be wrong, but I’m going with it for now. 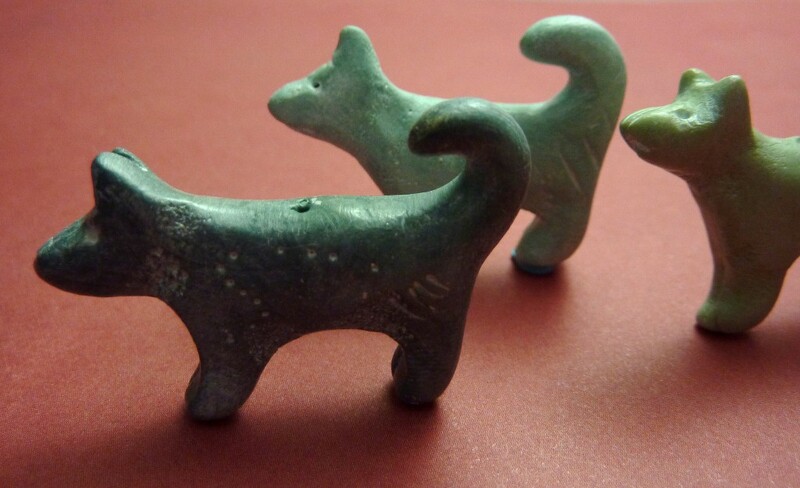 A whole pack of ancient dogs! Running with the dogs. For Joanne! 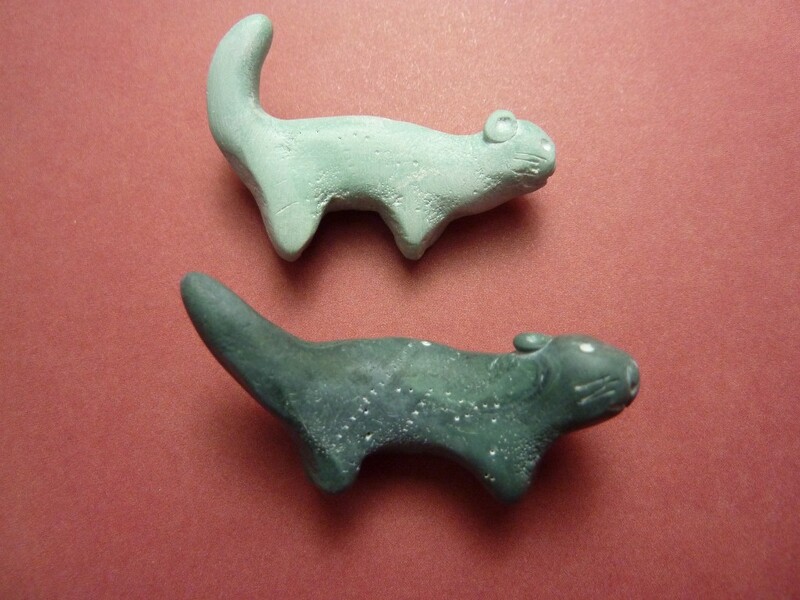 I also have two little otters who are different from their brethren. Their backs arch up. I think they look like they’re doing that thing kittens do, when they arch their backs and hop sideways. And look–see the tiny toes on this one’s feet?? Just a quick note, artist Nicole Caulfield is doing a portrait of my daughter Robin wearing my “Gaia” shaman necklace. She just sent me the first draft and it is beautiful! Nicole Caulfield's portrait of my daughter Robin wearing my Gaia necklace. Second portrait is the one I had done at a mall photo studio a few years ago. I still love this photo and use it as a large poster in my booth. 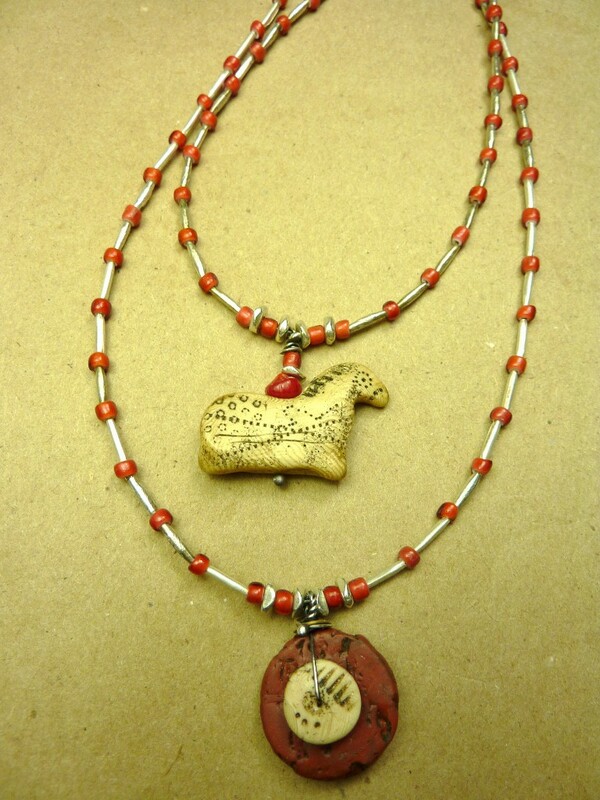 It shows my daughter Robin wearing my necklace, “Ceremonial”, made with my horse, shell and bone artifacts. 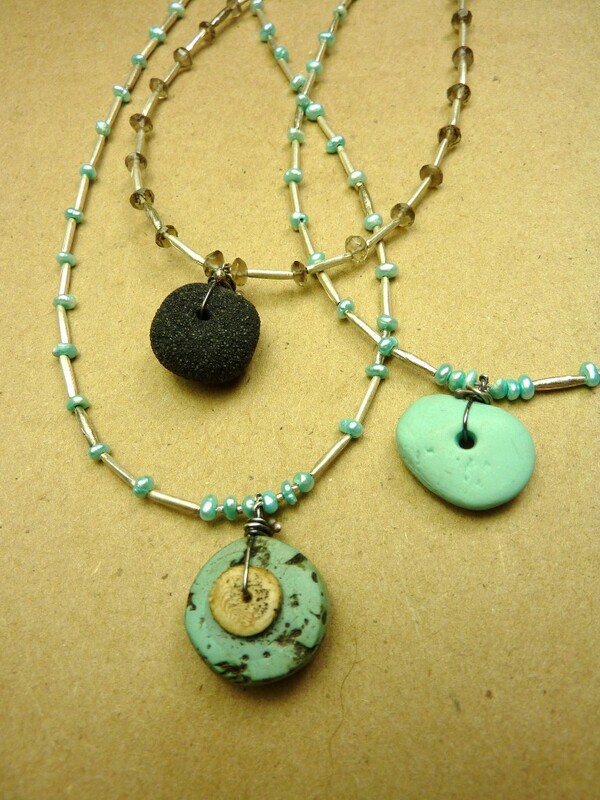 Charms made with antique trade beads, electronic resistors and vintage buttons, and tons of semi-precious stones such as turquoise, amazonite, jade, etc. The look is tribal and nomadic and fits my artwork beautifully. Something snapped loose inside me in the last few days, design-wise. I’ve made lots of the usual items for the upcoming League of New Hampshire Craftsmen’s Annual Fair–very simple and inexpensive animal necklace for the young and the new collector, braided leather cord necklaces for men, etc. And I have lots of pretty new items, too. But suddenly, things got wild. Last night I made the most wonderful earrings. They are so amazing, I put them on and have been wearing them ever since. I think I’m keeping them! 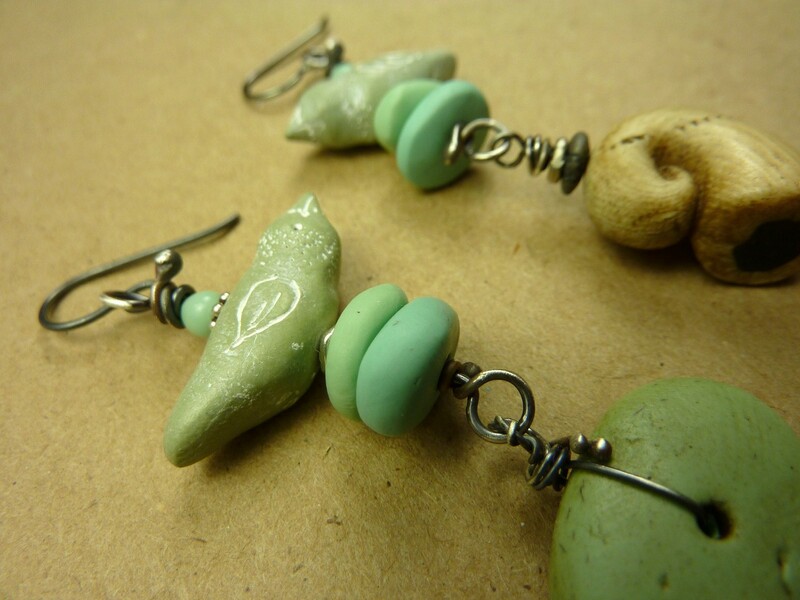 Not only are they beautifully made (if I do say so myself), they are incredibly light and easy to wear. I’m really feelin’ the cave these days…. And it feels deep, and rich. On a lighter note, I found this fascinating page while surfing the net for ideas for new markings. (More complete reading can be found here. Incredible!! This sends another shiver down my spine…. 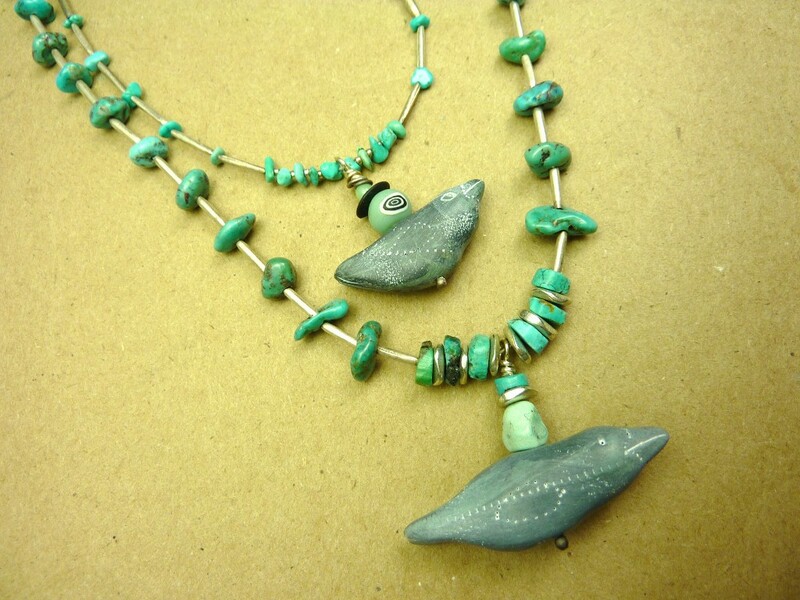 The second artifacts I made were fossil fish. The story I made for them was that they were trapped in layers of sediment, dreaming of forgotten oceans. “Where is the water they were promised?” I wrote in the little gift cards for them. When people asked me why my fish were grumpy, I said it was because they missed their oceans. How eerie to think that these ancient people perhaps also made stories about these creatures trapped in the stone. 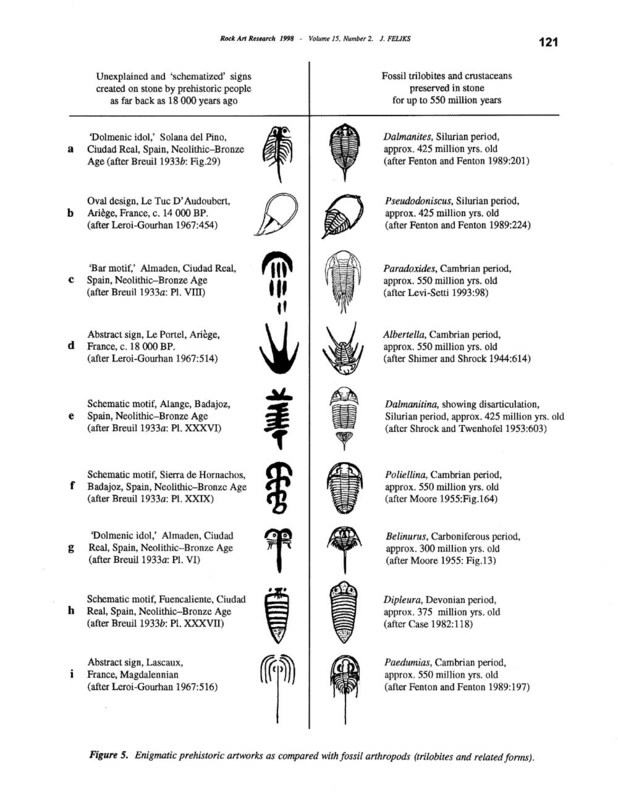 Stories that were important enough to include the fossil images in their art. I can’t even begin to think about what this all means. Perhaps it means nothing. But the on-going synchronicity of it all brings me, metaphorically, humbly, gratefully, to my knees. 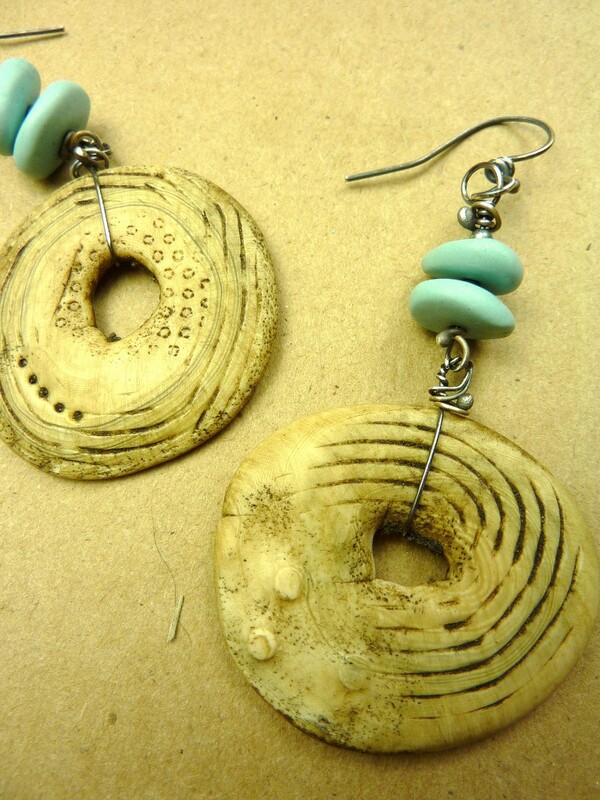 I’ve been working night and day on these new earrings. I’ve been making astonishing necklaces for awhile now. I realized I needed to make some astonishing earrings, too. 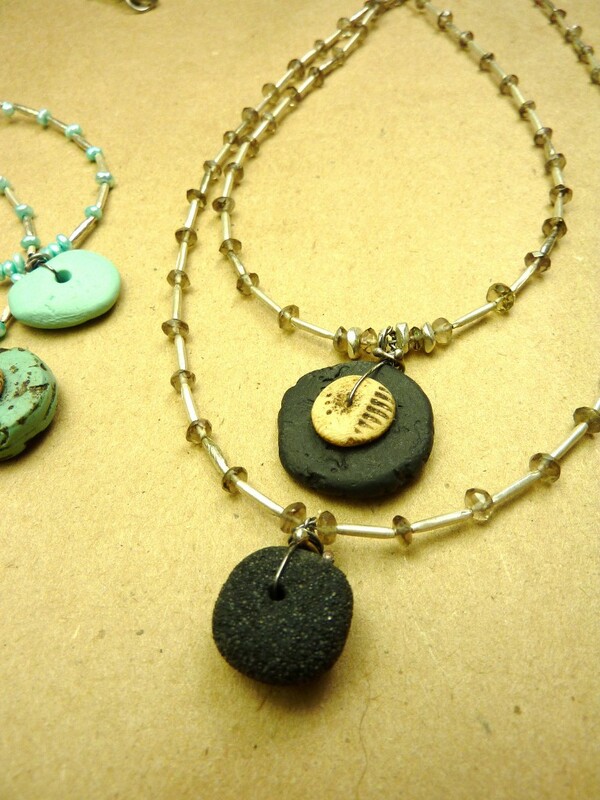 These came to me as I was thinking about my shaman necklace series. 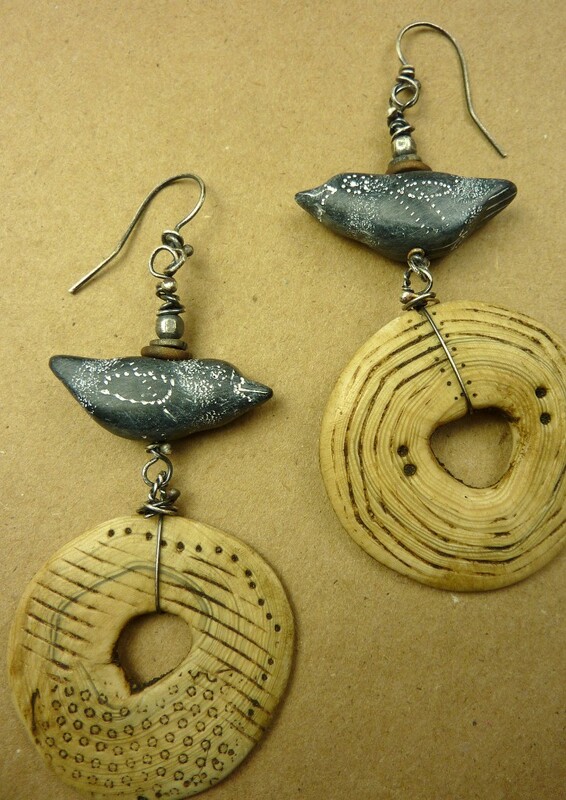 Suddenly, I realized I could get a little crazy with shaman earrings. And who said they have to match?? I’ve had customers asking for unmatched earrings for ages. Folks, I’m ready for you this year! 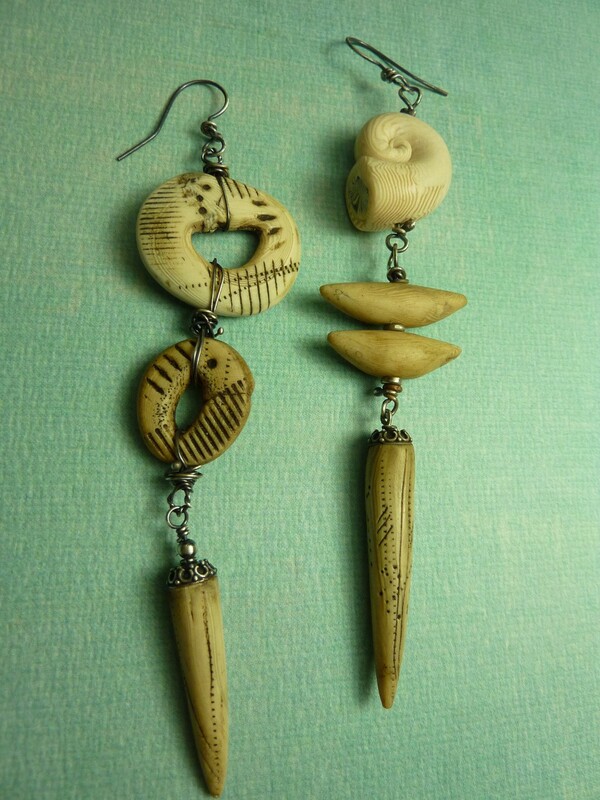 Not all the earrings will be birds, but I wanted to make some with my signature faux ivory. Black birds make these pop! 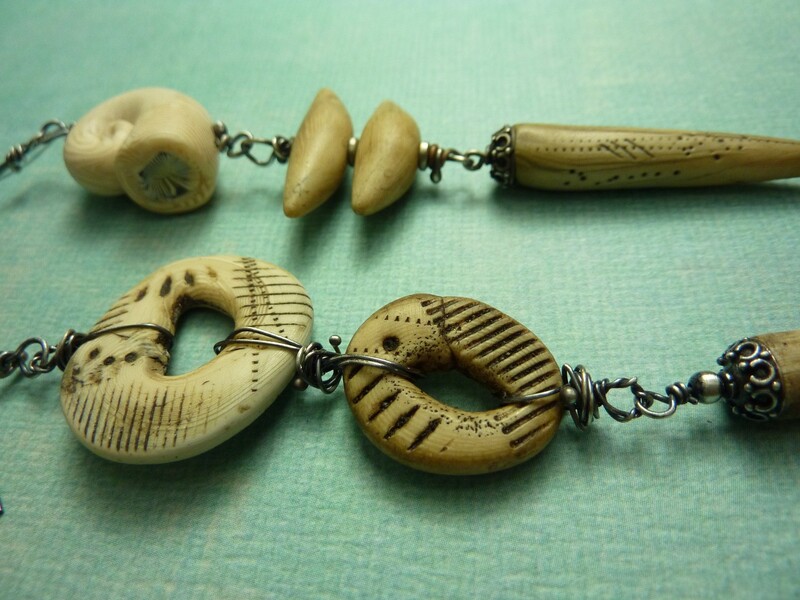 My faux ivory meets my new faux riverstones. 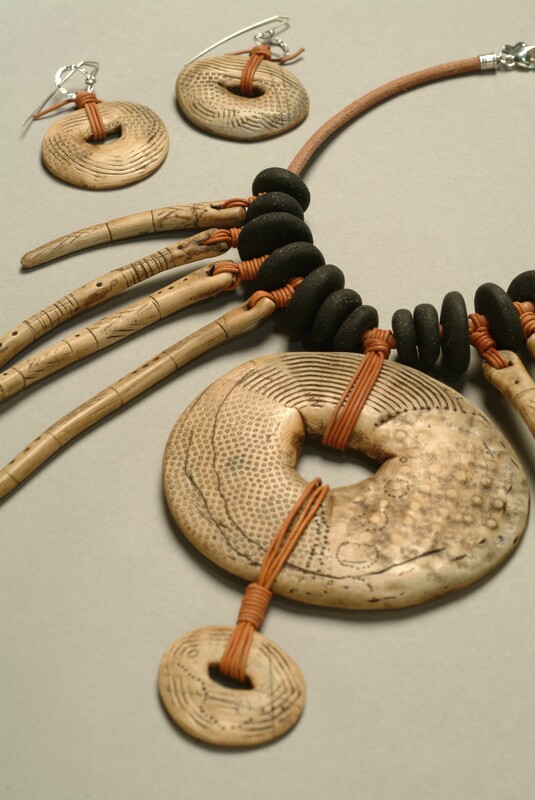 A few years ago, I began a series of “Shaman Necklaces”, inspired by neolithic artifacts. I wanted big, bold pieces, and I wanted them to look OLD. I decided to attach the artifacts with leather cord. But I had no idea how to tie them so they would look nifty. My daughter’s boyfriend at the time, an Eagle scout, suggested the collar and capstan knot. He couldn’t quite remember how to tie it, though, so I searched for it on the internet. And found this amazing video. So a big shout-out to the Marinews website in Australia and Andy’s World of Knots animated tutorials. I absolutely love watching these knot videos, though some of them make me dizzy. 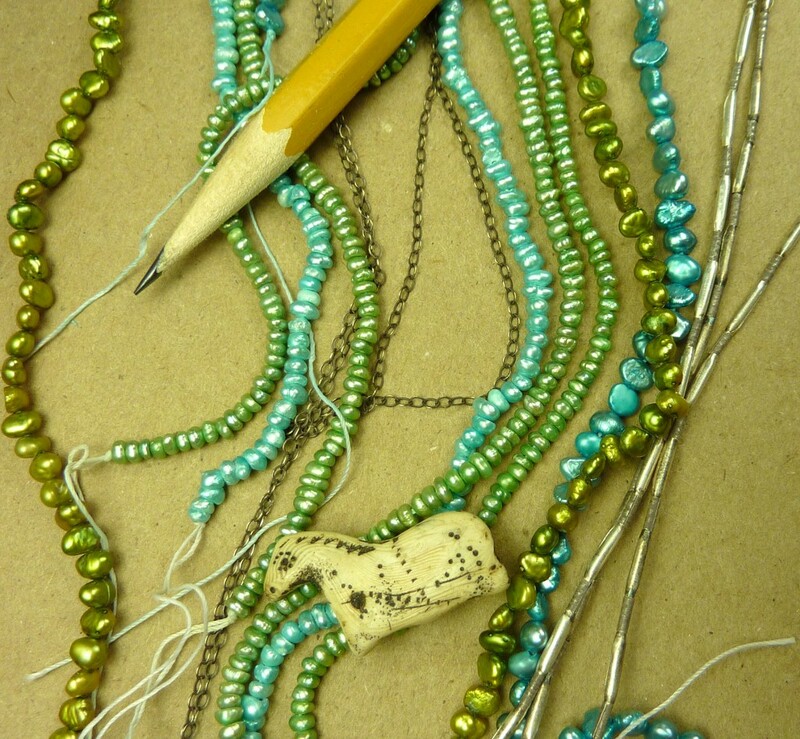 And I couldn’t have made my beautiful necklaces without them. I actually had to modify the technique a little, since I needed to connect two objects together. Why did I think of this today? Because I’ve been working on simpler, less expensive versions for the League of NH Craftsmen’s 77th Annual Fair next month. And I still need to check the video to refresh my memory! Thank goodness lives don’t depend on what I do….. 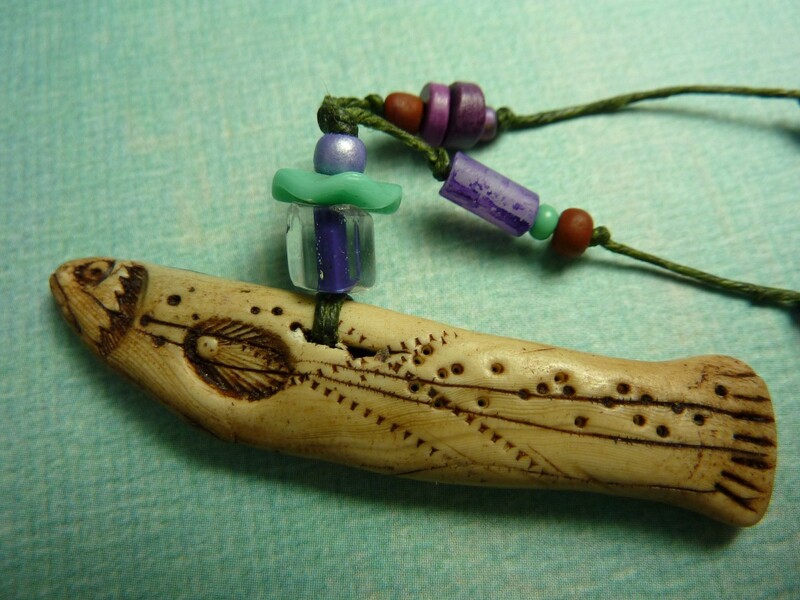 Author Luann UdellPosted on July 9, 2010 Categories art, craft, craft shows, creativityTags craft, craft shows, jewelry design, knots, product development art1 Comment on WHAT’S KNOT TO LOVE?